References AP_DIALOG_ID_REPLACE, BOOL(), AP_Dialog_Replace::getMatchCase(), AP_Dialog_Replace::getReverseFind(), AP_Dialog_Replace::getWholeWord(), and XAP_Dialog::m_id. References AP_DIALOG_ID_REPLACE, DELETEP, AP_Dialog_Replace::find_FIND_NEXT, AP_Dialog_Replace::find_REPLACE, AP_Dialog_Replace::find_REPLACE_ALL, AP_Dialog_Replace::findNext(), AP_Dialog_Replace::findPrev(), AP_Dialog_Replace::findReplace(), AP_Dialog_Replace::findReplaceAll(), AP_Dialog_Replace::findReplaceReverse(), FREEP, UT_Win32LocaleString::fromLocale(), AP_Dialog_Replace::getReverseFind(), XAP_Dialog::m_id, AP_Dialog_Replace::setFindString(), AP_Dialog_Replace::setReplaceString(), UT_UCS4String::ucs4_str(), UT_Win32LocaleString::ucs4_str(), UT_DEBUGMSG, and UT_return_val_if_fail. References _initButtons(), _onBtn_Find(), AV_FOCUS_MODELESS, FV_View::cmdUnselectSelection(), AP_Dialog_Replace::find_FIND_NEXT, AP_Dialog_Replace::find_REPLACE, AP_Dialog_Replace::find_REPLACE_ALL, FV_View::findSetStartAtInsPoint(), FV_View::focusChange(), FREEP, FV_View::getSelectionAnchor(), FV_View::getSelectionText(), FV_View::isSelectionEmpty(), AP_Dialog_Replace::m_pView, FV_View::moveInsPtTo(), AP_Dialog_Replace::setMatchCase(), AP_Dialog_Replace::setReverseFind(), AP_Dialog_Replace::setWholeWord(), UT_DEBUGMSG, UT_UCS4_strlen(), and xxx_UT_DEBUGMSG. References _DS, _DSX, _initButtons(), AP_DIALOG_ID_FIND, AP_DIALOG_ID_REPLACE, XAP_Win32DialogBase::centerDialog(), XAP_App::getStringSet(), XAP_StringSet::getValue(), XAP_Dialog::m_id, XAP_Dialog::m_pApp, and XAP_Win32DialogBase::setDialogTitle(). References UT_Win32LocaleString::c_str(), UT_Win32LocaleString::fromUCS4(), UT_GenericVector< T >::getItemCount(), UT_GenericVector< T >::getNthItem(), and UT_DEBUGMSG. References _updateList(), AP_Dialog_Replace::m_findList, XAP_Win32DialogBase::m_hDlg, and AP_Dialog_Replace::m_replaceList. References AP_DIALOG_ID_REPLACE, UT_Win32LocaleString::c_str(), AP_Dialog_Replace::ConstructWindowName(), UT_UCS2String::empty(), FREEP, UT_Win32LocaleString::fromUCS4(), AP_Dialog_Replace::getFindString(), AP_Dialog_Replace::getReplaceString(), XAP_Win32DialogBase::m_hDlg, XAP_Dialog::m_id, AP_Dialog_Replace::m_WindowName, XAP_Win32DialogBase::setDialogTitle(), and UT_return_if_fail. References XAP_Win32DialogBase::m_hDlg, XAP_Dialog_Modeless::modeless_cleanup(), and UT_ASSERT_HARMLESS. 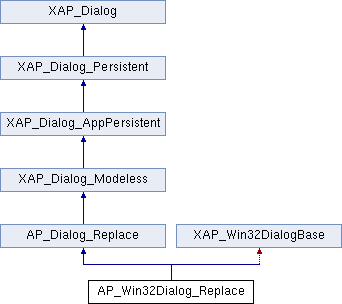 References AP_Dialog_Replace::ConstructWindowName(), XAP_Frame::getFrameImpl(), XAP_Win32DialogBase::m_hDlg, AP_Dialog_Replace::m_WindowName, and XAP_Win32DialogBase::setDialogTitle(). References AP_DIALOG_ID_FIND, AP_DIALOG_ID_REPLACE, AV_FOCUS_MODELESS, AP_Dialog_Replace::ConstructWindowName(), XAP_Win32DialogBase::createModeless(), FV_View::focusChange(), XAP_Frame::getCurrentView(), XAP_Dialog::getDialogId(), XAP_Win32DialogBase::m_hDlg, XAP_Dialog::m_id, XAP_Dialog::m_pApp, XAP_Dialog_Modeless::m_pDialog, AP_Dialog_Replace::m_pView, AP_Dialog_Replace::m_WindowName, XAP_App::rememberModelessId(), XAP_Win32DialogBase::setDialogTitle(), AP_Dialog_Replace::setView(), UT_ASSERT_HARMLESS, and UT_SHOULD_NOT_HAPPEN.